We were thrilled to announce the 2015 Award winner as Ron Simpson BEM. 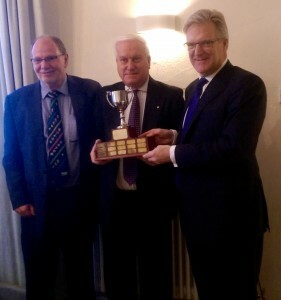 We had another full house at The Falcon Hotel, Uppingham on Friday 20th November 2015 – our members and guests enjoyed a delicious lunch followed by a few words from our guest speaker, Sir Edward Garnier QC MP, who then presented this year’s award winner, Ron Simpson BEM, with the trophy and prize. Thank you to all those who came and special thanks to Robert Wills and The Falcon Hotel who kindly sponsored this year’s award.